The Globe Swift, also known as the Globe/Temco Swift, is a light, two-seat sport monoplane from the post-World War II period. The Swift was designed by R.S. "Pop" Johnson in 1940, despite the fanciful story which has now entered into popular mythology surrounding the Swift's origins, that a Culver Cadet was obtained as a "template" aircraft. The design was financially secured by John Kennedy, president of the Globe Medicine Company, to be built by his new Globe Aircraft Company. World War II interrupted their plans, however, and the 85 hp (63 kW) GC-1A Swift advertised as the "All Metal Swift" re-designed by K.H. "Bud" Knox, received its type certificate on 7 May 1946. Two prototypes were built but essentially, the design remained the same as the type entered production. Globe built about 408 GC-1As. Later that year, the Swift received a more powerful engine of 125 hp (93 kW), making it the GC-1B. Globe, together with TEMCO, built 833 GC-1Bs in six months. Globe was outpacing sales of the Swift, however, and did not have enough orders to sell all of the aircraft being built. As a result, Globe was forced into insolvency. TEMCO being the largest debtor paid $328,000 to obtain the type certificate, tooling, aircraft, and parts to enable them to continue production in late 1947, in the hope that reviving production would enable TEMCO to recover their loss. TEMCO went on to build 260 more aircraft before shutting Swift production down permanently in 1951. The type certificate for the Swift was obtained by Universal Aircraft Industries (later Univair) along with all production tooling. Spare parts continued to be built until 1979 when the Swift Museum Foundation under the leadership of President Charlie Nelson purchased the Type Certificate, parts and tooling. 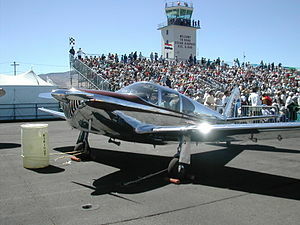 The most unusual variant of the series became a separate design, the TEMCO TE-1 Buckaroo which was built in a short-run first as a contender for a USAF trainer aircraft contract, and was later transferred to foreign service as a military trainer. Several of these trainers have since returned to the civil market. ^ a b Davisson 1983, p. 71. ^ Davisson 1983, p. 67. ^ Davisson 1983, p. 69. ^ Davisson 1983, p. 70. ^ "GC-1 Swift." flugzeuginfo.net. Retrieved: April 17, 2010. ^ "Type Certificate Data Sheet No. A-766." airweb.faa.gov. Retrieved: April 17, 2010. ^ Lednicer, David. "The Incomplete Guide to Airfoil Usage." ae.uiuc.edu, October 2007. Retrieved: April 17, 2010. Davisson, Budd. "Swiftly, Swiftly: An Appreciation of one of General Aviation's Classic Aircraft." Air Progress, Vol. 45, No. 8, August 1983. Lert, Peter. "In The Air: Used Singles Guide." Air Progress, Vol. 48, No. 7, July 1986. Wikimedia Commons has media related to Globe Swift. This page was last edited on 22 May 2018, at 07:56 (UTC).